Home Pregnancy Tests Pregnancy Test FAQs How Long Is Urine Good For A Pregnancy Test? How Long Is Urine Good For A Pregnancy Test? Why is urine sample discarded if not used within the time frame? What is the reason for using a fresh sample of urine for taking a pregnancy test? Can I store urine for taking the pregnancy test later? Can blood in urine affect a pregnancy test? 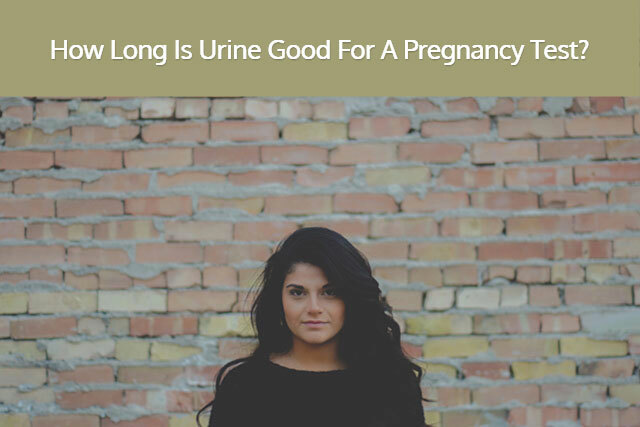 How long is urine good for the pregnancy test? Urine is good for 24 hours to take a pregnancy test. The best time to take a pregnancy test with stored urine is 6-7 hours. You don’t need to refrigerate urine for the first 24 hours. Storing urine poses the risk of spreading germs from the container. Our readers often ask us about this. Woman presume that the urine has spoilt as it was kept standing for long. Others want to know that for how long can urine be retained for the pregnancy test. Storing urine doesn’t affect the pregnancy test accuracy. Some of the working women might want to know if they can collect their sample of urine and test later that day when they are free. This is especially the case with those who have to leave early in the morning for offices and jobs. Now we will tackle the questions in detail! Urine doesn’t degrade until 24 hours. You can store and use urine for pregnancy test carefully in a clean container with a lid. The reason why early morning urine is used because it has higher levels of hCG than the entire day’s urine. Also, the volume is more at this time. It only happens in the morning that you have a large quantity of concentrated urine. Other times of the day you can hardly resist a full bladder for long. Urine stored properly for 24 hours is fit for a pregnancy test. You can take a pregnancy test with 24-hour old urine. If you want to store urine for taking a pregnancy test, then you can keep it in an airtight container. Ideally, urine is most suitable for pregnancy test within 6-7 hours. Do you need to store urine in the refrigerator? If you live in a country with a high daytime temperature, then keep the urine in a cool, dry place. Urine exposed to high temperature can spoil. It is better to take another urine sample if you want to use urine for pregnancy test after 24 hours. In 24 hours you will again have concentrated urine. In fact, your urine concentrates within a matter of 4–5 hours. If you drink a lot of water, then you will have to wait longer. Excess water will fill the bladder and dilute the urine. Precautions for storing urine for pregnancy test are difficult than a fresh sample collection. In any case, a fresh urine sample is better than 24-hour old urine for pregnancy test. A new sample of urine further plays down the chances of getting a false pregnancy test. Whenever you have any contamination in urine, the sample is no longer fit for taking the pregnancy test. The reason for discarding an old sample is not because the hCG evaporates or vanishes. It is only for hygiene purposes. Urine has a lot of other things than merely salts and water. Also, it is difficult to find the right place for keeping the urine. You can’t refrigerate it as the medical laboratories do. So it may spill over, or any other accident of the kind happens. Hence it is better to take the pregnancy test there and then as soon as you take the sample. Is fresh urine better for the pregnancy test? Another thing that might affect urine is atmospheric oxidation. If urine is not stored properly, then it can get oxidized and hence you will get unusual substances forming in it. While professionals can figure out what went wrong, you would only accept the false result as your fate. It can be dangerous. Hence, ideally, you should store urine for taking the pregnancy test for no more than 6-7 hours at most. The only reason where storing urine will be advisable is when the urine has contamination. Storing urine for pregnancy test allows the impurities to settle down. But this is only possible for dip strip pregnancy tests. If you have a midstream pregnancy test, then you cannot store urine for pregnancy test. If you are getting blood in your urine, there are two possibilities. You have a urine infection, or you are experiencing implantation bleeding or spotting. In either case, blood comes along with your urine. If you don’t allow the urine to stand for some time, then this will interfere with the pregnancy test results. If you are experiencing implantation bleeding, then it is not the right time for taking the pregnancy test. It is critical because it is too early to carry out the test. Placenta forms after implantation. It later starts producing the pregnancy hormone – hCG. The pregnancy test uses this pregnancy hormone to detect pregnancy. If you take the pregnancy test while implantation is underway, you will get a false negative pregnancy test. No, blood in urine will not affect your pregnancy test. Blood doesn’t react with the pregnancy test dye. Blood in the urine cannot alter the pregnancy test. However, if you are bleeding while taking the pregnancy test then you need medical help. Bleeding in early stages of pregnancy is not safe as it could be a miscarriage. If this is the implantation bleeding, then you may be taking the test too early. Blood can color urine if you have heavy bleeding. Implantation bleeding is not substantial. If you have vaginal tissues passing in your urine, then you should call the doctor. Blood in moderate amount will not affect the pregnancy test. Blood will not prevent getting a positive pregnancy test. But blood can interfere with a negative pregnancy test result. It is because the pregnancy test uses colored lines for displaying pregnancy test results. Blood in excess will give a false pregnancy test. But if you prevent the blood in the urine from touching the pregnancy test strips, then it will not. It is most likely that blood will not affect the pregnancy test. Blood is too heavy to move in the pregnancy test strip like urine. So even if you have blood in urine, it will not travel in the pregnancy test strip. We understand that the contemporary woman has a lot more to do than sitting at home and blush at pregnancy test results. But for the safety of you and your little one you should ideally take out the time if not on weekdays, maybe Sunday? Health is the most crucial possession, and nothing should be enough to persuade you to compromise on that. If i conceived 2 weeks back. And from 1st day from my last periods date, Dr tells me that my baby is 4 weeks. So I am confused will it be a size of sesame seeds or not ? You’re four weeks pregnant. So your baby will be the size of sesame seed because the early two weeks just form the part of pregnancy and not the baby development. Baby’s development begins after actually conceiving. Discard the kit after use. Such tests will show a faint line called evap after some time. When your urine dries up on pregnancy test it leaves a mark. The only valid pregnancy test result is which you see within the reading time. Take another test if you want to cross check.